There's no such thing as a formal auto insurance score, but you can take steps to improve your car insurance rates. A car insurance score is an arbitrary number not utilized by the insurance industry or individual insurance companies. However, the information that would comprise an insurance score — driving history, vehicle type, location, credit score, and other factors — is used by insurance companies to determine rates. Let’s review the ways insurance companies set their rates. Age, location, vehicle type, and other personal information are important contributors to auto insurance premiums. Below are common characteristics that could result in a “poor” auto insurance score and expensive premiums. If you’re a young driver, i.e, younger than 25, you can expect to pay a premium for your car insurance. Auto insurance companies see young drivers as more likely to take risks behind the wheel and more likely to file claims. 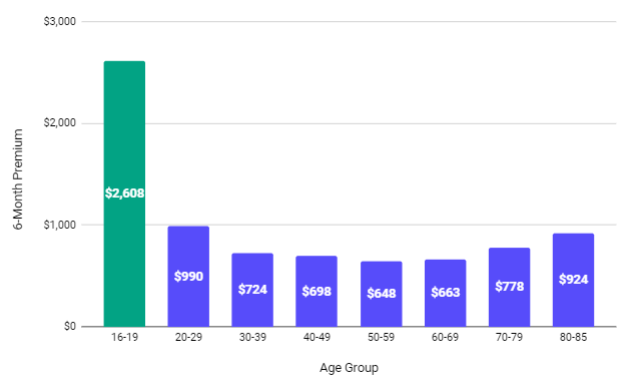 Thus, young drivers are more expensive to insure. How does age impact car insurance? High-performance vehicles or vehicles with high MSRPs lead to more expensive premiums. Because the insurance company is responsible for any damage a vehicle causes (liability) and replacing or repairing (collision/comprehensive coverage), the value of a vehicle can contribute to its insurance costs. Insurance is independently regulated by each state and priced by ZIP code. Some states require high levels of minimum coverage (Michigan), leading to more expensive rates. Drivers in ZIP codes with substantial insurance losses and dense driving populations also face expensive rates. Although it has relatively little impact on insurance rates, not being a homeowner may lead to more expensive premiums. 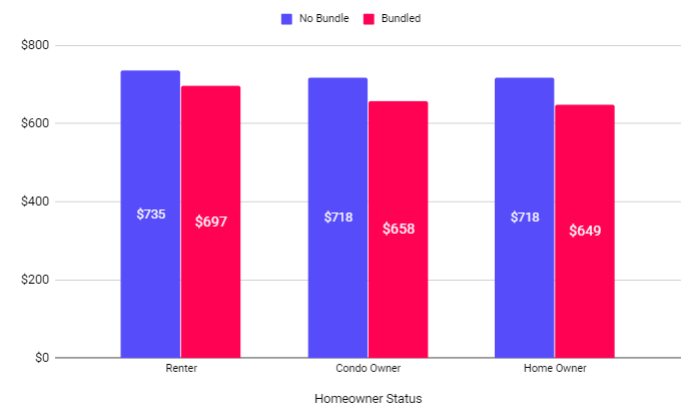 Homeowners are seen as more financially stable and less risky to an insurance company. Thus, their auto insurance premiums are slightly lower than renters. Married couples usually pay less for car insurance than do unmarried drivers. As with homeownership, marriage is seen as a risk-dampener in the eyes of an insurance company. 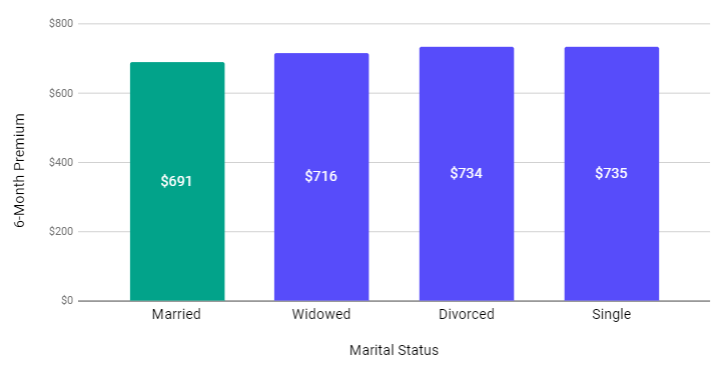 Married drivers typically pay approximately $44 less per policy period than do single insurance clients. Unlike an “auto insurance score,” a credit score is an accredited report used to assess an individual's credit standing. Credit score is a major insurance rating factor, as insurance companies use it to gauge a potential client's reliability. 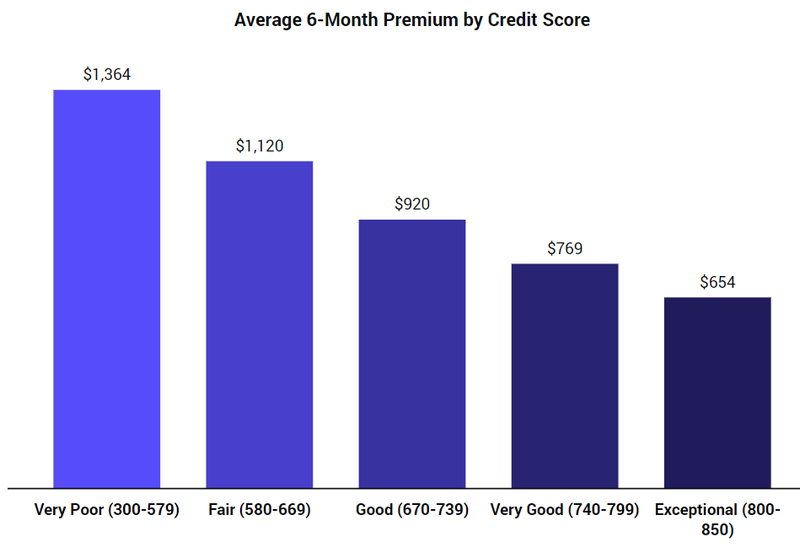 On average, a driver with poor credit pays $552 more per six-month policy than a driver with good credit. 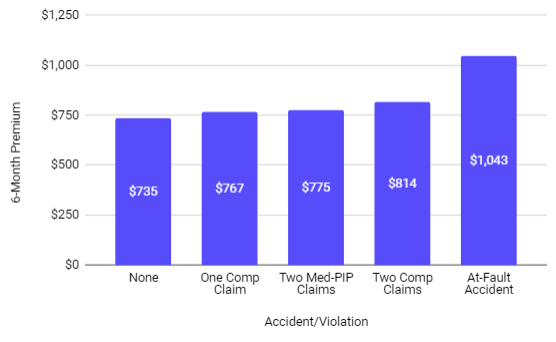 FTC studies show drivers with poor credit file more claims — and more expensive claims — than do drivers with good credit. Driving record is utilized in every state to help determine auto insurance premiums. 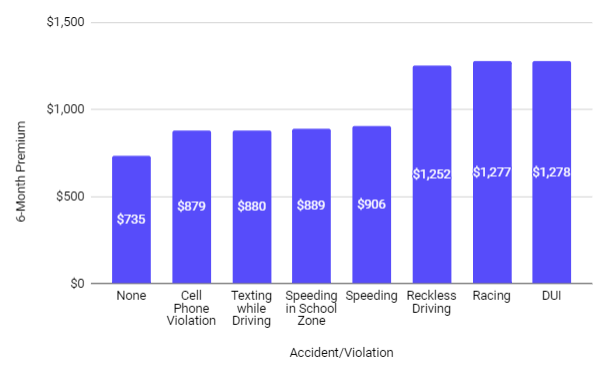 Speeding tickets, DUIs, and reckless driving citations have significant impacts on premiums. Most insurance companies will charge drivers for these violations for between three and 10 years. A driver's insurance score will suffer for a long while after they are cited for a serious violation. Like driving history, insurance claims history is a primary contributor to car insurance rates. An at-fault accident will increase a driver's premium by $309 every six months. Like a DUI or speeding ticket, an accident tends to stay on a driver's insurance record for a while: between three and five years. Should you get an insurance score? An insurance score is an indirect way of estimating your auto insurance premium. Unlike a credit score, no major financial institutions recognize an insurance score as a unit of measurement. However, an insurance score should reflect how much you can expect to pay for insurance. For example, a low insurance score means you will pay more for auto insurance. The best way to determine what you will pay for car insurance is simply to get a quote. Better yet, get as many quotes as you can. Getting an insurance quote will not affect your credit score or impact your current rate. Enter your ZIP code below to get started. Does identity theft impact car insurance?